Full of arrogance but zero performance – Hardik Pandya has been declared the real man of the match by England as whenever they needed some quick runs, he came to their rescue. Hardik Pandya ,the darling of Virat Kohli, has again showed us that he is just an ordinary cricketer. His first innings spell of 8 overs went for 51 runs. That’s not acceptable at all considering he only took the wicket of Cook and the fact that England scored at a run-rate of only 3.2. Come the Indian innings, Pandya walks in like he is going to conquer the world. With his toothpick physique, he falls for just 4 runs. But no issues. There is still plenty of time left in the match to make amends. In the England 2nd innings, Kohli gave the ball to Pandya when they desperately needed to finish off the tail. Maybe Kohli thought Hardik can do the job. However, the so-called all-rounder had other plans. His spell of 9 overs went for nearly 4 runs per over making him the most expensive bowler in both innings and with only 1 wicket to his name. But wait. 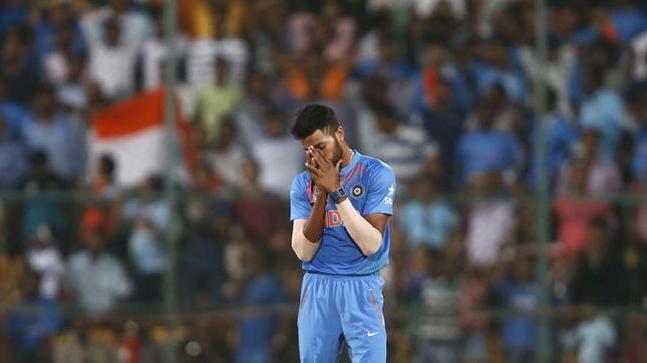 There is still one golden opportunity left for Hardik Pandya to make himself a hero. He walks in with his team in trouble – having lost the massive and match-defining wicket of Kohli – and what does he do? Gets out for a duck. All of a sudden, India are now five down staring at a series defeat. What a complete and all-round performance. Well done, Pandya.